My commitment to myself today was to recommit to excellent self-care which has fallen by the wayside as the end of summer gives way to a bustling fall. 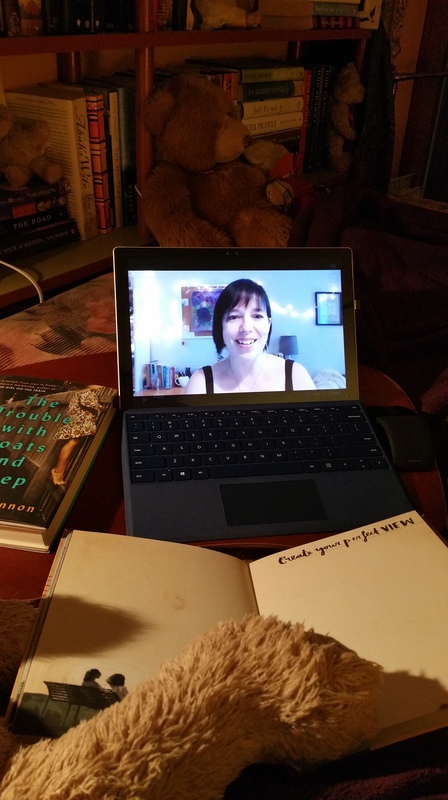 I’ve joined Jaime Ridler’s Journal Club which meets on Fridays for an hour of connection, synchronicity, laughter, aha moments, writing, doodling, sharing, and feeling incredibly welcomed and accepted by a group of kindred souls. I missed half of last week’s call as I had to leave early. The calls are recorded so we may revisit or participate later if we can’t make the live call. But the live call is my preference as it is so inspiring and energizing! Today is my catch-up-and-take-time-for-myself day so my ideal view is of me watching Jaime on my laptop all snug in my creative nook. We three Tri Vista bloggers are taking a page (artistically unnumbered) from Eleanor Shakespeare’s ‘Collage this Journal’ to share here on OTV. This week is ‘create your perfect view’. Well, I am indeed working on THAT by refitting a sailboat to cruise the Caribbean and having an endlessly perfect view but that’s a future blog post, lol. We don’t have an inviting physical view from where we live—encroaching neighbors with a minuscule yard but it’s filled with soothing vistas inside. From where I type there is a gorgeous view of an autumn tree on my wall in vivid orange and reds; and glowing fairy like butterfly chrysalises hanging from the branches. This view makes me sigh with contentment. Trees do that for me. On our permanently unfinished kitchen wall (sans cabinets) there is a huge poster of a hammock hanging from palm trees over a transparent ocean. I can visualize myself having just vacated this idyllic spot; leaving a throw and pillow behind while I fetch a sweating glass of orange liquid topped with a tiny colorful paper umbrella. Another sigh. The ocean does that for me. In the background of my computer screen are my bookshelves—lovingly stocked with my favorite hard covers. Yes, I do know they will not all fit on the boat and I am working to embrace ebooks as easily as I have audio books. It’s a love hate relationship. We have several bookcases in our home bursting with tomes and photos and knickknacks which create an oasis of loving memories and a perfect view. Third sigh. Books do that for me. My perfect view also brings to mind my inner view and how practicing being grateful this year has manifested dreams and unexpected gifts and delights. My inner view is currently focused on balancing work, play, creativity, and relationships and not tipping the scales too far in any one direction. Writing brings me back to myself, helps me refocus, grounds me, and offers me a jumping off place into a new adventure or sometimes a plateau to enjoy the view and savor the moment. Final deep sigh. Writing does that for me. You? What’s your perfect view dear reader? What makes you sigh with contentment? 29 Sep	This entry was written by Laura and published on September 29, 2016 at 7:37 pm. It’s filed under Collage this Journal, Commitment, Connections, Gratitude, It's Thursday, Journaling, Laura, Lifeology, Self Care. Bookmark the permalink. Follow any comments here with the RSS feed for this post. …this is totally publishable, Sweet Girl…you are journaling the boat experience too, right? I definitely agree with KMG…and so very much appreciated your views…can relate to each…sailing the Caribbean, hmmm…stoppin’ by Aruba, per chance? HItch a ride? I adore having my own personal fan club in you both dear ones! ♥ Aruba? Oh, YES!